↑ "Skin Cancer Treatment (PDQ®)". NCI. 2013-10-25. Archived from the original on 5 July 2014. Retrieved 30 June 2014. ↑ Marsden, edited by Sajjad Rajpar, Jerry (2008). ABC of skin cancer. Malden, Mass. : Blackwell Pub. pp. 5–6. ISBN 9781444312508. Archived from the original on 29 April 2016. ↑ Lynne M Dunphy (2011). Primary Care: The Art and Science of Advanced Practice Nursing. F.A. Davis. p. 242. ISBN 9780803626478. Archived from the original on 20 May 2016. ↑ "General Information About Melanoma". NCI. 2014-04-17. Archived from the original on 5 July 2014. Retrieved 30 June 2014. ↑ Gallagher, RP; Lee, TK; Bajdik, CD; Borugian, M (2010). "Ultraviolet radiation.". Chronic diseases in Canada. 29 Suppl 1: 51–68. PMID 21199599. ↑ Leiter, U; Garbe, C (2008). "Epidemiology of melanoma and nonmelanoma skin cancer—the role of sunlight.". Advances in Experimental Medicine and Biology. 624: 89–103. PMID 18348450. doi:10.1007/978-0-387-77574-6_8. ↑ Chiao, EY; Krown, SE (September 2003). "Update on non-acquired immunodeficiency syndrome-defining malignancies.". Current Opinion in Oncology. 15 (5): 389–97. PMID 12960522. doi:10.1097/00001622-200309000-00008. ↑ Jou, PC; Feldman, RJ; Tomecki, KJ (June 2012). "UV protection and sunscreens: what to tell patients.". Cleveland Clinic journal of medicine. 79 (6): 427–36. PMID 22660875. doi:10.3949/ccjm.79a.11110. ↑ "SEER Stat Fact Sheets: Melanoma of the Skin". NCI. Archived from the original on 6 July 2014. Retrieved 18 June 2014. ↑ "Release: Cancer Survival Rates, Cancer Survival in England, Patients Diagnosed 2005–2009 and Followed up to 2010". Office for National Statistics. 15 November 2011. Archived from the original on 17 October 2014. Retrieved 30 June 2014. ↑ Cakir, BÖ; Adamson, P; Cingi, C (November 2012). "Epidemiology and economic burden of nonmelanoma skin cancer.". Facial plastic surgery clinics of North America. 20 (4): 419–22. PMID 23084294. doi:10.1016/j.fsc.2012.07.004. ↑ Dubas, LE; Ingraffea, A (February 2013). "Nonmelanoma skin cancer.". Facial plastic surgery clinics of North America. 21 (1): 43–53. PMID 23369588. doi:10.1016/j.fsc.2012.10.003. 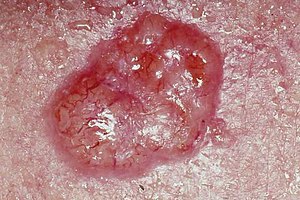 ↑ "How common is skin cancer?". World Health Organization. Archived from the original on 27 September 2010. Retrieved 30 June 2014. ↑ World Cancer Report 2014. World Health Organization. 2014. pp. Chapter 5.14. ISBN 9283204298.